A long-time friend visited for a few days recently. She is one of my “non-dog” friends. But she is one of my cherished “creative” friends, who makes jewelry and knitted items worthy of QVC. Plus she makes her creations look easy to make; I was to find out it was an illusion as she helped me learn to knit. When she visits, usually once a year, we pick up where we left off last time. She is one of those cherished friends who is the sister I never had. We laugh and gossip and knit or bead, cook and compare funny stories from Facebook. She makes me realize that good friendships feed the soul, a need I don’t fulfill often, preferring to cocoon myself in the safety of my dogs. One of the items D brought me was a kit to knit a Quaker Yarn Stretcher shawl (the pattern is on Ravelry). My anxiety skyrocketed when she presented it to me. There were terms in the instructions I’m not familiar with, like “pfb” (purl front and back-an increase) and “sl1 wyif”, (slip one stitch with yarn in front). Over a two-day period I drove D nuts (I thought) making mistake after mistake. But gradually there were fewer cuss words from me. D rewrote the instructions for me, making them easier to follow. They are often in knitter’s shorthand, like repeat rows 1-5, then go to 6, return to 1-5, then do something different on rows 12-14 and what row was I on? Then she had me watch You Tube video instructions on the “pfb” stitch, over and over, then try it, pause the tape, try the stitch. It was starting to make sense. At the same time I was learning the new stitches, watching the video, trying to figure out the instructions, hyper-puppy was (rightfully so) very needy. He wanted to run and play and everything except sleep. No wonder I couldn’t figure out what row I was on. 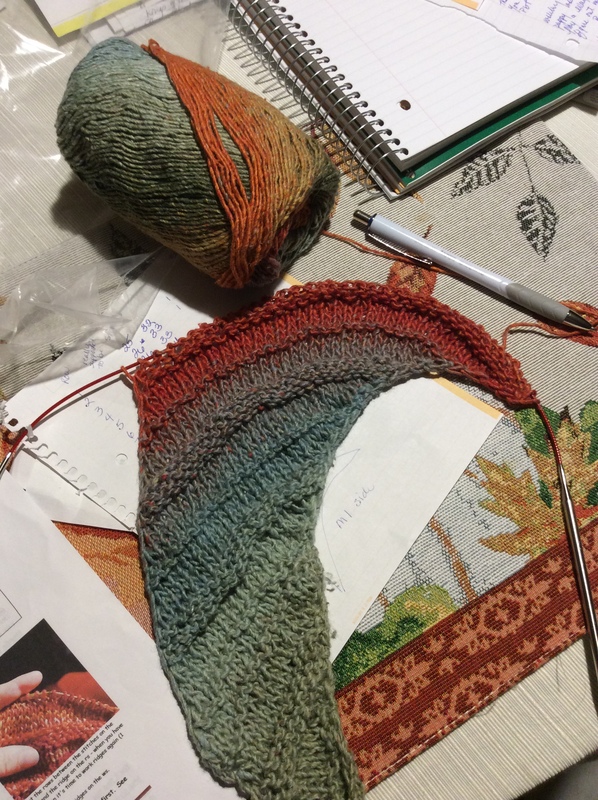 By the end of the three days the shawl’s instructions had a rhythm, knit one row, increase another row, knit ridges every once and awhile for effect. D and I could relax a bit more, she effortlessly making beautiful socks. Here and there we showed off our beaded jewelry and discussed future projects. By the end of the visit it was like we lived next door, sharing recipes, laughing as we compared our cat’s antics. All too soon we said good-bye. Late that morning she called and left a frantic message on my cell phone. My heart cringed. Had she been in an accident? I called her back and discovered she had a minor emergency. Grabbing the puppy and putting him in the car crate I drove north on Interstate 65 to meet D. That’s what friends do, drop everything to help each other. On the way back I took an alternate country road and saw the hidden towns of Castleberry and Brewton, places unseen when hurrying north of I65, places I’ve wanted to see but never took the time. The trip, although unplanned, was relaxing and the perfect time to reflect on how learning to knit and fostering a friendship are very similar. We tread on eggshells in the beginning, afraid of saying something offensive, making a mistake, then someone cusses (usually me), leading to shared laughter and shared stories of crazy relatives, politics and crazier politicians, life goals and foibles and a friendship evolves and strengthens. This entry was posted in friendship, Knitting and tagged friendship, Knitting, Ravelry. Bookmark the permalink. Thank you! This was such a nice post.